The property is located in the heart of a small village (Puyvert) in the Luberon natural reserve renowned for the beauty of its landscapes, its azure skies, striking architecture of its hilltop villages and authenticity of the street markets. In summer the region offers fans numerous festivals, some of which are internationally famous: Theater in Avignon, Opera in Aix-en-Provence, and Piano in La Roque d'Anthéron (10 minute drive from the house). The interior of this typical house was renovated respecting old materials while providing a refined and warm contemporary design. The ground floor, with lovely vaulted ceilings, has a large living room, one double bedroom (queen bed), a shower room and a kitchen-dining room, equipped with all modern amenities, opening onto the terrace and the garden. The first floor has a large master bedroom with a beautiful view of the garden and surrounding hills (one queen bed and one single bed, AC), a second bedroom (two single beds) and a spacious bathroom with separate bath and shower, displaying an original tadelakt and pastellone coating in olive green. On the second floor, two bedrooms with ensuite bathrooms (each one with a queen bed and AC) open onto a large terrace. This floor also has a relaxation area with a sofa and a mezzanine with an elliptical bike . All beds are new and very comfortable. 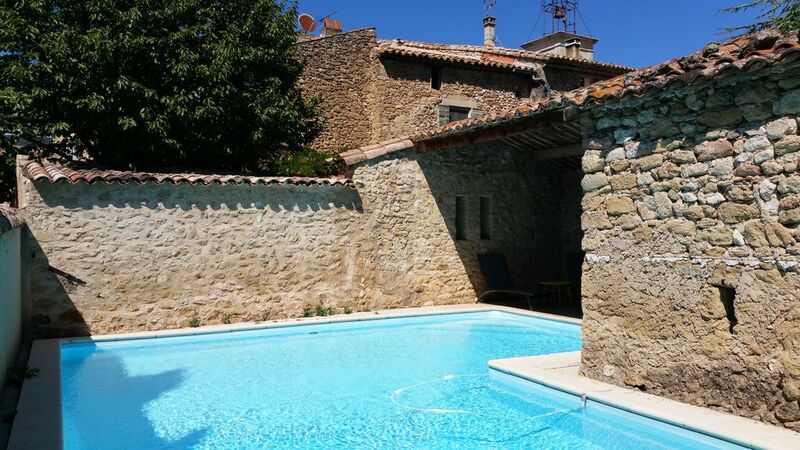 The property is 5 minutes away from the many shops, cafes, bars and restaurants of Lourmarin. For everyday shopping, there is also a very well-stocked supermarket located 800 meters from the house (3 minute drive) and an organic grocery store at 500 meters. At 50m, there is a "bistro" with fresh bread available everyday. AC in the 3 main bedrooms, the 2 remaining ones are naturally fresher. Parking slot in the house entrance. Free public parking 50m away from the house. I stayed here with some family members and we loved it! The little village is quiet and located very close to other towns that are worth visiting. The kitchen is very well equipped to make family dinners. The house is beautifully decorated. The garden is very peaceful and the pool perfect to cool off during the Provençal summer heat. We’ll come back next year! Deux semaines de vacances inoubliables ! La Bergerie, qui comme son nom l'indique est une ancienne bergerie, a été très bien rénovée, avec des matériaux nobles et beaucoup de goût. Les photos sont parfaitement conformes à la réalité, aucune déception possible ! Nous y avons séjourné avec nos enfants, ainsi qu'avec une amie et ses propres enfants, et c'était tout simplement merveilleux. La maison est disposée de telle façon qu'il est facile de ne pas se gêner les uns les autres, même avec de jeunes enfants. Le jardin, superbe et totalement clos, offre aux heures les plus chaudes des petits îlots de fraîcheur et c'est un délice de lire allongé sur l'herbe à l'ombre des arbres. La piscine réussit le prodige d'être parfaitement sécurisée sans pour autant être défigurée par une barrière en plastique. Bref, c'est une maison à la fois fonctionnelle et magnifique, et j'espère vraiment y séjourner à nouveau un jour. Le séjour fut très agréable, au calme. La maison, magnifiquement restaurée et décorée, est spacieuse et ouvre sur un beau jardin ombragé et rafraichissant. La piscine est séparée du jardin par une porte, ce qui offre toute l'intimité nécessaire (et la sécurité aux enfants). La maison étant située au coeur d'un petit village, on y est au calme, tout en profitant très facilement de l'animation et des activités des plus gros villages des alentours.